The inspiration for this project came from my abiding fascination with birdsong. There was such interest (and discussion over group parameters!) that we decided to have a group using only the sound of birds (this CD) and another combining birds with human generated sounds, "Birds and Men". 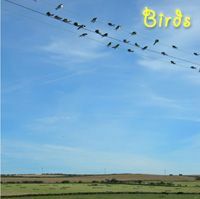 The birds of Penarth, South Wales, recorded in local parks, gardens and streets, accompanied by passing observers, planes, cars, scaffolders and bottle banks. Marlène Dietrich came back to Germany twice; once after world war two, the second time as a bird in Wuppertal, chatting with Orson Welles who reincarnated as a tune played by an icecream vendor. Recorded with a dictaphone in the garden of the grlfrn.